Konstantin Soukhovetski is one of the most captivating and distinctive young pianists to emerge in recent years. 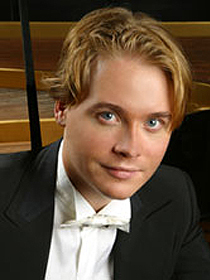 He won the First Prize and Audience Prize at 2007 New Orleans International Piano Competition and the distinguished 2006 William Petschek Debut Recital Award. Born in Moscow in 1981 to a family of artists, he studied at the Moscow State Conservatory Special Music School before entering the Juilliard School where he earned his AD, BM and MM degrees and in 2003 received the Arthur Rubinstein Prize. In 2008 Mr. Soukhovetski will release two solo CDs on his new label – Constant Records.